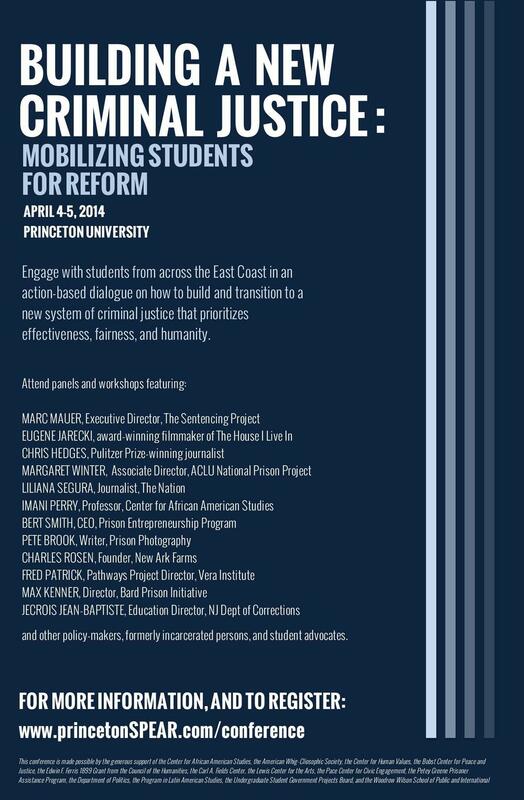 I’ll be partaking in the student-organised prison reform SPEAR Conference this weekend. If you’re in or near New Jersey think about stopping by. Some very knowledgable thinkers, doers, journalists and activists will be convening. Below is the program. Marc Mauer, Executive Director of the Sentencing Project. 2:15pm. Panel 1: Academic Research on Incarceration. Brings together academics from a range of disciplines to discuss their research on mass incarceration. ; Charles Loeffler, Jerry Lee Asst. Professor of Criminology, University of Pennsylvania. Kiminori Nakamura, Asst. Professor, Department of Criminology and Criminal Justice, University of Maryland; Jill Witmer Sinha, Asst. Professor, Rutgers School of Social Work. Moderator: Imani Perry, Professor, Princeton University Center for African American Studies. 4:30pm – 6 pm. Panel 2: Alternative Approaches to Prison Reform. Exploring alternative approaches to prisoner education and reentry programs through arts, entrepreneurship, job training, and urban farming. Bert Smith, CEO, Prison Entrepreneurship Program; Pete Brook, Writer-editor-blogger, Prison Photography; Francis Lawn and Diane Cornman-Levy, Roots to Reentry; Charles Rosen, Founder, New Ark Farms. 7:30pm. Film Screening – The House I Live In, followed by discussion with Eugene Jarecki, filmmaker; and Chris Hedges, Pulitzer prize-winning journalist. 9:30am – 10:50am. Panel 3: Prison Education. Brings together various perspectives on prison education, ranging from participant, to teacher, to policymaker. ; Fred Patrick, Director of the Pathways Project, Vera Institute; Max Kenner, Bard Prison Initiative. 11:00-12:00pm. Workshop A: Getting Involved. How to implement and improve educational programs between your university and local correctional facilities. Jim Farrin, Executive Director; Petey Greene Prisoner Assistance Program; Jecrois Jean-Baptiste, Education Director, NJDOC. Workshops B and C: In the Classroom. How to tutor effectively in prisons, with current/former students and volunteers. ; Danielle Rousseau, Director, Boston University Prison Education Program; Jim Matesanz, Field Coordinator, Boston University Prison Education Program. Workshop D: Reentry Programs. Discussing entrepreneurship programs and other reentry projects. After learning about academic approaches and educational programs, what political steps can we take to make our voices heard and affect policy-makers’ decisions? ; Margaret Winter, Associate Director of the National Prison Project, ACLU Jeremy Haile, Federal Advocacy Council, The Sentencing Project. How to use various forms of media and journalism in order to begin engaging and effective conversations. Liliana Segura, The Intercept, First Look Media; Pete Brook, Prison Photography.